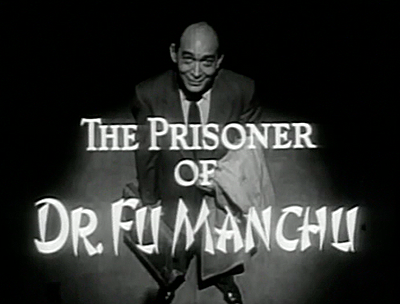 The Prisoner of Dr. Fu Manchu was the first of a thirteen episode television series made be Studio City Television Productions, which was the television arm of Republic Pictures. 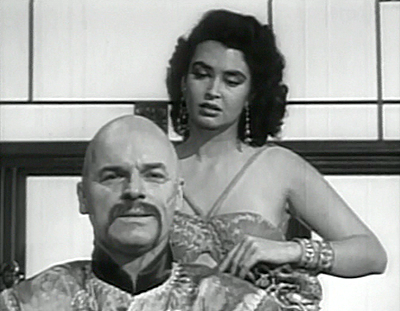 The decision to make the serial was most probably based on the success of the Republic cliffhanger serial, The Drums of Fu Manchu (1940), which is considered one of the greatest serials ever made. Incidentally, The Drums of Fu Manchu was edited down to 69 minutes and released as a movie in 1943. 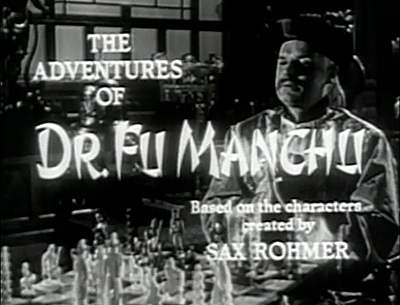 The co director of The Drums of Fu Manchu, William Witney also helmed (at least) seven episodes from this series. Black and white. Life and death. Good and evil. Two sides of a chess game. Two forces in the universe – one magnificent – the other sinister. It is said that the Devil plays for men’s souls. So does Dr. Fu Manchu – Satan himself – evil incarnate! As the story begins, a newspaper floats across the screen. The headline reads: ‘Professor Hugh Yan key to World Crisis’. Hugh Yan (Leonard Strong) is a special delegate to ‘The Conference of Nations’ from an un-named Asian country. He flies from the east; stopping briefly in Hong Kong for the plane to refuel and for Yan to give an interview where he outlines his formula for World peace. Then he continues his journey.Then we are introduced to the evil Dr. Fu Manchu. Glen Gordon plays the devil doctor, and is clearly not Asian. In fact it would appear that the whole cast is Caucasian with simple makeup effects to make them look Chinese. I guess this is nothing new, Swedish actor Warner Oland, Sidney Toler and Roland Winters all played Charlie Chan, and Peter Lorre played Mr. Moto. Oland played Fu too. I guess things had not changed much even in the 1960s, when Christopher Lee played Fu Manchu with prosthetic eye pieces to make him look Asian. Fu Manchu has two constant minions throughout the series. The first is a midget named Kolb, played by John George. A quick glance at IMDb, it would appear that George had an amazing cinematic career, beginning in the silent era in 1916 and working through until his last appearance in Sinatra’s Ocean’s Eleven in 1960. All in all, appearing in one-hundred and thirty productions – but the truly staggering thing he only received screen credit on a handful of occasions. Fu Manchu’s other minion – or should I say concubine is the gorgeous Karamaneh, played by Hawaiian beauty Laurette Luez. Luez’s alleged claim to fame, is that she gave struggling actress Norma Jean Baker her stage/acting name; which was Marilyn Monroe. As we meet Fu Manchu and his minions they are hypnotising Betty Leonard (Carla Balenda). Betty is a nurse who works at the airport, checking tourists as they come through customs. 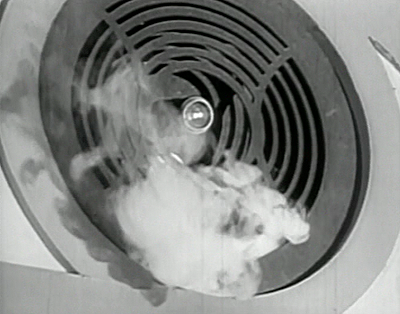 Under hypnosis, Fu Manchu tells her that Hugh Yan will be arriving soon, and suggests that he will have a rare tropical disease and only she can save his life. The serum she is told to use is hidden in her purse. Sir Dennis Nayland Smith (Lester Matthews), late of Scotland yard, is the chief security officer at the Peace conference. Hi assigns his close friend, Dr. John Petrie (Clark Howat), to monitor the wellbeing of the delegates as they arrive in the country. 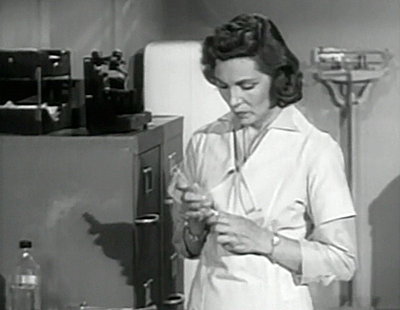 Hugh Yan arrives, and under Fu Manchu’s hypnotic spell, Betty injects him with the serum provided by the devil doctor, but Dr. Petrie arrives in the nick of time before she can inject the full dose. But nonetheless, Yan slips into a coma and is taken to the hospital. One thing about this incarnation of Fu Manchu is that he appears to have video cameras everywhere. He spends a large amount of time in front of the television watching as he plans unfold, and as such always knows what is going on. Seeing that Betty has failed in his mission, Fu sends another minion to the hospital to kidnap Yan. Nayland Smith believes that Fu Manchu is behind Hugh Yan’s disappearance – and as such the whole peace conference is jeopardised. Events become even more tangled, when Yan finally does turn up at the conference, partially paralysed after his ordeal. But this Yan is not the same beacon of hope and possibility. This Yan is full of mistrust and contempt. At only twenty five minutes each, and with each episode fairly self contained, there is not much time for an overly convoluted plot or character development, and as such this series is a shallow time killer. At least the episodes are fast paced, and have a certain amount of outlandish – if not quite developed – plot situations. I would suggest that this series will offer very little to those who do not have an interest in the character Fu Manchu or vintage television.